Lukas Krämer 5d, Bernd Radmacher 4d, Marlon Welter 4d and Matthias Terwey 5d have qualified for the final round of the upcoming German Championship. They will join Franz-Josef Dickhut 6d, Johannes Obenaus 5d, Jun Tarumi 5d and Benjamin Teuber 6d in Darmstadt for the July 4-7 final. In Germany the championship is divided in two rounds, a preliminary and a final round. The top 60 players in Germany are eligible for the preliminary round; this year 16 players from 3-5 dan showed up June 15-16 in Kassel to compete for four seats in the final, where Dickhut, Obenaus, Tarumi and Teuber were pre-seeded, based on the results of the previous championship. Unfortunately Robert Jasiek 5d – who took first place in last year’s prelim – arrived to late to take part in the tournament due to train problems. After six rounds in a close field nobody was undefeated. Krämer, Radmacher and Welter managed to win five out of six games. 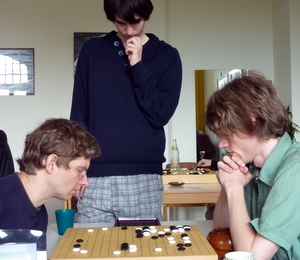 The fourth seat is often decided on tiebreakers, and Matthias Terwey 5d must have been quite worried to have lost his first two games against 3-dans, but a winning streak in the following four rounds was enough to secure him a place in the final round. Some of the games will be broadcast on KGS.